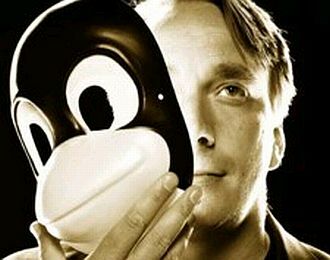 Linus Torvalds, creator of Linux and Git, behind the official mascot of the Linux kernel, the penguin Tux. Personally (the author of this blog) I use Linux since August 1996, thanks to my classmate Guillaume Foliard, who connected me with the ANRTT group in Toulouse, created by David Robert and few friends of him including Jean-Christophe Arnu, Marc Thirion, David Rocher, Emmanuel Chaput, and Patrick Magnaud, among others. I will remember for ever my first meeting with them, in salle Marnac of Ramonville Saint-Agne. To my knowledge, this group was one of the first Linux and Free Software users group in France. I was preparing my Diplôme d’Études Approfondies in Mathematics in 1996-1997, and to be honest, I devoted a great part of my time to the learning of Unix instead of doing Mathematics! I am very happy with Linux, both at home and at work. It suits perfectly a mathematician like me who likes intellectual freedom and computer science concepts. I tried first the Slackware distribution, and then switched quickly to RedHat for few years, and then to Debian ten years ago. I also tried a bit Mandrake, Ubuntu, and various other Linux distributions. I even tried by simple curiosity other Unix-like operating systems such as FreeBSD (now at the heart of Mac OS X). But nothing suits me like Debian (I should say Debian GNU/Linux). I am impressed by the strength, via Linux, of the fourty years old concepts of Unix, and by the GNU Project. I wonder if in the near future, a young guy will come with something completely new and revolutionary. Linux based operating systems are nowadays fully functional and easy to use, thanks to the development of Free Software such as X.Org, KDE, GNOME, LibreOffice, Firefox, Thunderbird, GIMP, etc. This development is impressive, and the differences with non-free operating systems and software are presently negligible. My 68 years old mother is now using Debian GNU/Linux daily. I do not see GNU/Linux as a conceptual revolution. It is brilliant engineering work, sometimes innovative, always pragmatic. However, the ideas of Free Software developed by Richard Stallman were revolutionary at the social level. With Linux, this anarchy utopia of Stallman became massively concrete. 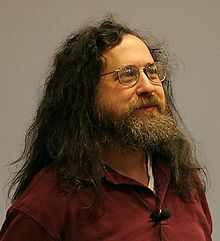 Wikipedia is another implementation of the anarchy utopia of Stallman at the social level (powered by Linux and various other free software including GNU software, Apache, MySQL, and MediaWiki). To me, the success of free software is due to the absolute of Stallman and to the pragmatism of Torvalds. Debian GNU/Linux: an analysis was performed for Debian GNU/Linux version 4.0 (2007). This distribution contained close to 283 million source lines of code (the Linux kernel represents few percents), and the study estimated that it would have required about seventy three thousand man-years and cost US$7.6 billion (in 2011 dollars) to develop by conventional means. Unix: actually everybody is using a Unix like operating system everyday, for instance via smartphones (including the iPhone), and when using Internet since most DNS servers are powered by a Unix like operating system.